If you are a freebie master and haven't paid for a razor or shaving cream for years - you might not need this tip! But if not, here is how to make your razor last longer. Simply pour a little bit of baby oil on the blades before you shave. 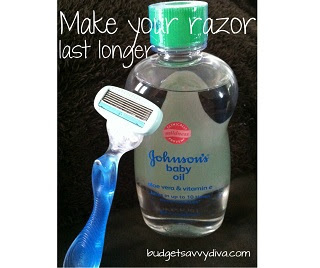 You can also shave with baby oil, rather than using shaving cream, for a smoother (and closer) shave! I like to put some baby oil on my legs after I shave, for a smoother, more comfortable feel. Salena Roper posted: Well, I never heard it before, so it's new news to me. Is there unscented baby oil? The scent gives me headaches. Denise Jacot Goveia posted: Another great use for Olive Oil!! Great idea, I'm going to try this one!